Spirit Board multiplayer and fighter adjustments are also included. First revealed in the Super Smash Bros. Ultimate Direct last November 1, 2018, Mario’s potted enemy, Piranha Plant is now playable as a fighter in Super Smash Bros. Ultimate. 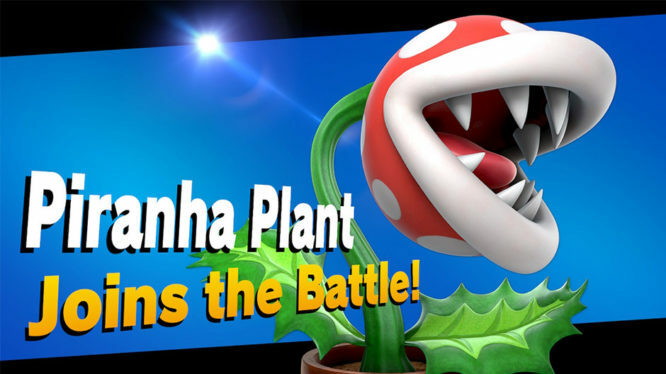 Piranha Plant was expected to release in February 2019 but came as part of the 2.0.0 update released for Super Smash Bros. earlier today. Players who redeemed the early purchase bonus will gain access to the DLC fighter immediately after updating. Version 2.0.0 also includes the ability to play Spirit Board with up to four players. Previously this was restricted to single player battles only. The release notes for the update are included below with specific fighter adjustments available on Nintendo’s website. You can now play Spirit Board with up to four players. Select the spirit you want to challenge on the Spirit Board, and then go to Party → Fighter to select the number of people who will play. When playing with multiple people, you will lose the battle if any player is KO’d. The following spirits will now appear in the Shop. The calculation for Global Smash Power has been adjusted. Added the DLC fighter, Piranha Plant. Piranha Plant will become available for purchase as DLC at a later date. Pressing both jump buttons at the same time will now cause you to short hop. If you’re playing Smash Bros. Ultimate and haven’t claimed Piranha Plant yet, you have until January 31st to do so. A download code will have automatically been sent to those who purchased digitally but players who opted to buy Smash physically will need to register their game card before the code is sent. Piranha Plant is the first DLC fighter to be released in Super Smash Bros. Ultimate with Joker from Persona 5 being next in line for release. Nintendo has stated that they also intend to release Piranha Plant as paid DLC in the future.